The Las Vegas rally is underway, which can mean only one thing: the new American Scooterist is out! #48/49 is very special, it’s a 52-page double issue celebrating the 50th anniversary of the Vespa GS. It features an in-depth look at the various GS models from around the world, personal memories from original GS owners, and even complete rebuild directions. As part of the hard-working American Scooterist team, I really strongly suggest you join VCOA today, or at the very least, order it from the VCOA club store. 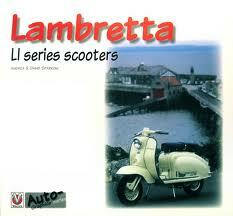 Veloce Publishing was kind enough to send a review copy of Andrea and David Sparrow’s Lambretta LI Series Scooters (order from Amazon) . You may remember the Sparrows from their mid-nineties “Colour Family Album” series. This book is part of Veloce’s “Autographics” series, but the general premise is exactly the same as the Lambretta Colour Family Album: Lots of great photos annotated with text outlining the history of the machine. After a month or so of rumors of the demise of Scoot! Quarterly, Barry and Casey announced on the BBS that scooterists Josh Rogers, April Whitney and Mike Zorn will be taking over the magazine. Thanks, Barry and Casey for your hard work, and best of luck to the new crew!